Town history is included in pictures, books and artifacts that can be viewed any day of the week. The historians’ office is located at the Town Hall, 99 Tower Dr., Bldg. A, Middletown, NY. You can speak with the historian on Thursdays between the hours of 1-3pm or by appointment. 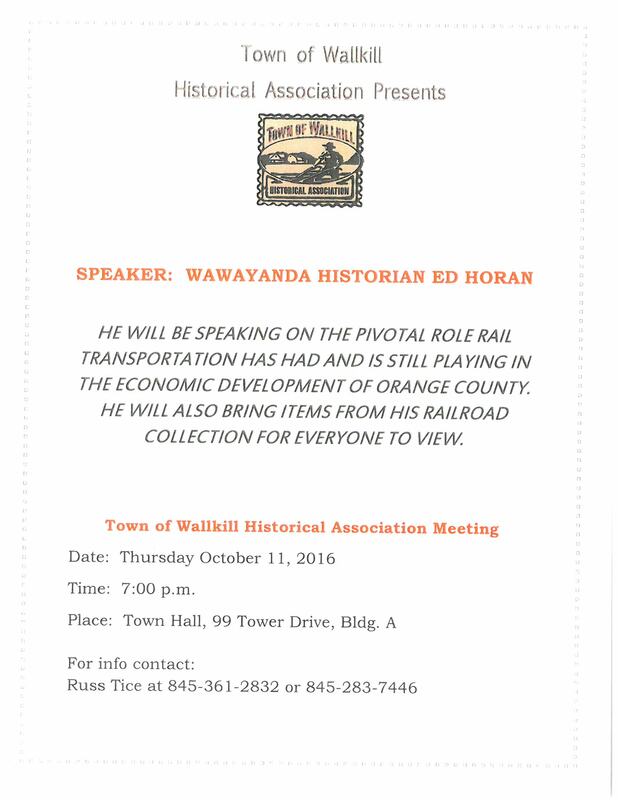 The newly formed Historical Association of the Town of Wallkill was created to collect, preserve, document and display aural, visual and physical artifacts which tell the history of the Town of Wallkill. Meetings are held on the first Thursday of the month beginning at 7:02pm at 99 Tower Dr., Bldg. A, Middletown, NY. For further information please contact the Town Clerk at 845-692-7833. The Town of Wallkill was established April 7, 1772, at the home of Samuel Watkins in Campbell Hall in the present Town of Hamptonburgh. Vast tracts of wilderness, called patents, were acquired from the Indians over the period from 1703 to 1761. The original Wallkill Precinct was created from portions of two of these patents, the Minisink Angle and the John Evens Patent. Wallkill Precinct originally extended into Ulster County and was much larger than its present day boundaries. In 1798, by an act of the Legislature, the present Orange-Ulster County boundaries were formed. In 1782, the Congregational Church, at what is now Howells, was organized and has the distinction of being the second Congregational Church formed in the State of New York and the first church group in this area. In 1787, George Houston of Neelytown settled on 300 acres in the southeastern part of Wallkill. This land was bought for him by his father James Houston who was a descendant of Rev. Joseph Houston, first minister of the Goodwill Church of Montgomery. In 1796 a church was organized at the home of George Houston and he donated three acres for a church site and burial ground. Because of the preponderance of Scottish families, it was decided to name the settlement which grew up around the church, Scotchtown. The First Congregational Church was organized in 1785 in the settlement not yet known as Middletown. The church acquired 1/2 acre of land from the estate of John Green, to which was added 15-1/5 square rods from the husband of the minister's niece, Jonathan Owen. The Rev. Charles Seelay served as the first pastor and construction was begun in 1786 but not finished until some ten to twelve years later. In 1792, several families joined to organize the Wallkill Old-School Baptist Church which met at various places for thirty years before building on land donated by Silas D. Horton at Rockville, some two and three quarter miles north of Middletown. A fifth church was organized in 1799 in an area between the present Fair Oaks and Bloomingburg. the meeting house was known as "The Old Union House." Scotchtown - situated on high ground, this section of country being about one thousand feet above tide-water. It undoubtedly took its name from the nationality of the early settlers, McVey, McWhorter, McInnis, McLaughlin and McCord. The first store opened in 1803. There was also a wagon-shop and blacksmith-shop. Mechanicstown - about two miles east of Middletown which sprang up around the forge and trip-hammer works of Messrs. Otis & Miller. There was a hotel there, a glove manufactory and a feedmill. Its name was derived from the fact that it was a settlement of "industrious mechanics." Circleville - half way between Scotchtown and Bloomingburg was previous to 1791 a thick forest, with a single log house, occupied by a Mr. Coddington. Circleville's post office was established in 1850. There was a blacksmith shop there, wagon-shops, shoe-shops and two creameries. Samuel Bull, Sr., a blacksmith who settled near Circleville, is said to have been employed constructing the chain used in the obstruction of the Hudson River during the Revolution. The name Circleville was given to the Church and Village by Mrs. Mary Bull, who thought Circleville, in Ohio, was a very pleasant name. Phillipsburgh - (was known as Hampton in 1806, but the name was changed due to the number of families by the name of Phillips) lies east of Middletown, on the Wallkill River, and was a place of great expectations. With its magnificent water power, and government contracts for powder during the War of Revolution, it had every prospect of advanced growth. People from the vicinity of what is now Middletown went to Phillipsburgh to do their shopping. However, the growth of Middletown as an important railway village, dwarfed Phillipsburgh. The Erie began daily service in 1843 and Middletown became the end of the line and an important rail center. Howells Depot - was a station on the Erie Railroad northwest of Middletown. The post office was established in 1846. Early businesses comprised of freighting and general traffic of the Erie Railroad; a general merchandise store, drug store, hardware store, tin shop, hotel, blacksmith and wagon shops and a meat market. Van Burenville - name bestowed upon a village near the northeast angle of the Town of Mount Hope. It arose from the establishment of a post office by that name, given no doubt in honor of President Martin Van Buren. It was formerly a place of considerable business on an old stage-route; however, the opening of the plank-road left Van Burenville away from travel routes and its business disappeared. Fair Oaks - was a station upon the Midland Railroad, later known as the New York; Ontario and Western. Fair Oaks was established May 14, 1872. A hotel built there had been opened for business the day the battle of Fair Oaks, Va. was fought. This battle prompted the naming of the hamlet, Fair Oaks. Rockville and Bull Hack - were both south of Circleville. Rockville's name was derived from a huge rock on the slope of a hill. Bull Hack's name originated from William Bull's descendants who "hacked" through the dense forest to settle this area. Crawford Junction, Purdy's Station and Lockwood - were trackside stopping places on the New York, Ontario and Western Railways. Millsburgh - a ridge of land running from Scotchtown toward Bullville, was a neighborhood settled, among others, by Jacob Mills, whose descendants were numerous and constituted the prominent families of the district. Stony Ford - was so called as early as 1767. It was a fording place over the Wallkill River from Montgomery. There was a rift across the stream at this point literally paved with cobble-stones. Brimstone Hill - in the northern part of the town, was so named from a story told of a drinking spree at an old log tavern in early times. Being short on glasses, an extra one was brought in that had been used in mixing up some brimstone. In the darkness of the evening a man drank whisky from the glass... and the place was so named. Michigan (Michigaan Corners) - the name applied to a cluster of houses on the crest of Three-Mile Hill, in the eastern part of the Town. Named because Malcolm McLaughlin bragged about his imaginary trip to Michigan to the extent they nicknamed him Michigaan. Davistown - was an old name for a neighborhood in the eastern part of the town, near Three-Mile Hill, arising from the Davis families, which were numerous in that section. La Grange - had its first post office in the Town of Wallkill. It was called "Wallkill" and was kept by John Monell. Another post office was a large, hollow white-oak tree. Any person being at the vicinity of Scotchtown, would bring them up and deposit them in this tree; then, as the neighbors passed, they would take what belonged to themselves and leave what belonged to others. Honey-Pot - was a mellifluous name bestowed many years ago upon an excellent spring of water a mile or more from Circleville. There were various traditions as to the reason for the name, whether it was because of the sweetness and purity of the water that flowed from the spring, whether a "bee-tree" with its rich deposit of honey once stood by the spring, or whether stolen honey was once hidden there, remains a mystery. Guinea - an old name applied to a settlement of black people, east of the Honey-Pot farm. They had been the slaves of Col. McLaughry, of new Windsor, and were freed by him, 1825 to 1828. This land was given to them by the Colonel. By 1809, the Town's location on the route between Sullivan County's lumbering and tanning products and the Hudson River made the building of the Montgomery Turnpike a profitable venture. Several other turnpikes followed making the area through which they were routed a trade center. By 1848, Middletown had a population of 1360 and incorporated as a village. In 1851, the Middletown and Bloomingburg Plank Road was built and soon followed by a second one called the M. & U., which made transportation into the area and to the railroad even easier. Also in 1851, the world's first telegraph line was strung along the Erie Railroad and the first railroad train dispatch was sent over the portion of wire through Middletown from Turner's (Harriman) to Port Jervis. The Town of Wallkill became bitterly divided politically as the Civil War era approached and in 1860 the Republicans carried the first Supervisor's election and then the Presidential election in Wallkill. During the War, Middletown and Wallkill together supplied no less than six companies and regiments to fight for the Union. After the war, Middletown boomed and by 1888 Middletown was granted her charter as a city. Wallkill remained rural through the first half of the twentieth century. The town sent her children to state-drawn district schools and at the present time still has no school districts of its own. However, the town is still dotted with old one or two room school houses built between 1820 and 1850. Seven volunteer fire companies serve the Town. Howells Fire Company was established in 1924 followed by Mechanicstown Engine & Chemical Co. #1, Circleville Volunteer Fire Co., Washington Heights Volunteer Fire Co., Inc., Silver Lake Volunteer Fire Co., Inc., and Pocatello Fire Company. Bloomingburg Fire Company also covers a portion of the Town. In the early 1960's the Town of Wallkill began to feel the impact of development as new highways put it within driving distance of New York City and New Jersey. The opening of Routes 17 and 84 and the placement of interchanges in the Town changed the complexion of the area. In 1960, the census reported 8000, and in 1980 the census showed the population grew to 20,481. By 1987, it had grown to approximately 27,000. The "Miracle Mile," a section of Route 211 in the Town has become a regional shopping center. Many national and local retail stores have located in this area. The Board meets every second and fourth Thursday of the month at the Town Hall and also meets when there is a special need.